Hale Kai is a perfect place to enjoy your vacation with family and/or friends. Old Hawaiian Charm, spacious three bedroom, two bath beachfront home. This gem is located on a large half acre lot on Papailoa Road, one of North Shore's most exclusive neighborhoods. This gated home comes with a fully equipped kitchen, spacious living room area and two full bathrooms. Three bedrooms will sleep up to six people. The master bedroom has a king size bed and a view of the ocean. Both guest bedrooms have two twin beds. The dining room leads out to a large redwood lanai where guests can enjoy spectacular sunsets and gorgeous views of Laniakea Surf. This home also offers wireless internet service. Conveniently located near historic Haleiwa Town, you'll be close to restaurants, markets, art galleries, gift shops and much more! Rates from $2,450week. Call 808-637-3510 or email teamre@hawaii.rr.com for a rate quote and availability Minimum stay of 7 nights, shorter stays possible at the managers discretion. Perfect stay for our family! This is a charming beach cottage. You just walk out the back door, down the stairs and you are on the beach. Beautiful views, great location, close to town. The property is in a great location right on the water near Heleiwa. One thing to note is that the amount of sand of the beach shifts year to year. This year, there was almost no beach, so we had to walk down about 50m for a sandy beach. Not a big deal but different from the pictures. The Team team is always really responsive and helpful. We are already planning for next year. We were travelling with six adults and the house was just perfect for us. 3 bedrooms and 2 baths made for enough space for everyone. The beautiful lounge area with the large windows took our breath away every time we entered. Nice breezes and portable fans kept us cool. Location, location, location - but a bit run down. Third time at Hale Kai in 5 years. Nothing has been done to update the home. Sliding doors still stick and very hard to close. I think the sheets in the master are the same ones from 5 years ago. This time there were dirty dishes put away in the cupboard. Bit disappointed this time. AND, the beach was essentially gone (natures fault). There was some nice new deck furniture, plus the old icky chairs and white tables. The house has no A/C or ceiling fans and in July, it was sweltering. Fans did little to alleviate the heat. All that being said, the house is in an awesome location - you just have to time your trips out due to Kam Hwy traffic. Just to the West was awesome snorkeling - lots of turtles and fish. Wonderful. The perfect beach house! We like the north shore because it is near our kids stationed at scofield. The location was perfect. Beautiful beach for the first three days then increae in waves and all of our sand moved down the beach. The access stairs still reached the rock so we could get to the beach. Things are a touch dated but all works well and is a great beach house. A get away far away from the resorts, the high-rises. Third time at Hale Kai, a permanent memory. Love the semi-rustic environment. Close to places to eat, groceries, and tropical things to do. LOVED the privacy, walking the beach not seeing anyone, almost like your private beach. Our family of five adults really liked Hale Kai. It is a gracious older property with character but kept up nicely. Our senior member (80+) liked the single level layout once she negotiated the 8 entry stairs and she also liked the easy walk in shower in the bathroom. The views from the main bedroom and living areas were mesmerizing. The grounds are beautiful and the surroundings are peaceful and quiet. We have rented through Team Real Estate twice before and once again, they were friendly, helpful and always on hand to take care of any issues that might arise. We have come back many times to this house and love it. The upgrades on the coach was real nice. The beach is perfect and I love how quiet the street is. I grew up on this beach so it feels like coming home. Sophia was amazing and so supportive. The property was as good as when we stayed there in April 2016 for 4 nights. We had a great 9 nights in 2017 and already planning our next trip. Team Real Estate is the best! We always use Team Real Estate for our visits to the North Shore. All of their rentals are great ans the process is easy! We planned a 10 day vacation at Hale Kai. We could not be happier. The house was perfect for a family with a 4 year old. The yard was gated and lots of fun. The view perfect with stairs to the beach. To the left around the corner are where all the turtles eat and rest. Evening where spent watching the beautiful sunsets and sleeping to sound of the waves. Thank you so much for allowing us to enjoy your home. I hope we can come back. This home is peaceful in its own ways. It is a good place to go to get away from it all. It is also a special place where you can sit forever undisturbed, all hours of the early morning through night, and never get tired of just staring into the clear blue waves and horizon, or gaze up in the midnight blue sky with the moon and stars sparkling around you. As far as you can see there is a beautiful view from the living room out to the ocean. The beach hosts children playing on the sand, paddleboards, kayakers, fisherman, surfers, and the sailboats seem to disappear into the sunset. 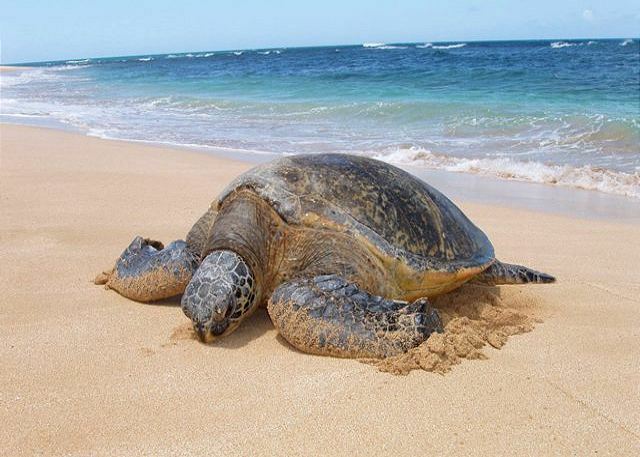 Walking along the beach, not to far out, turtles peek out of the water and sometimes come up to the beach to bask in the sun. Property is steps from the beach and in a wonderful location close to Haleiwa on the North Shore. The house is older, but very charming. We stayed the last week of July and it was pretty warm, but the fans provided at the house helped circulate the air. I wouild definately recommend the house! What a little piece of Paradise. We had a fantastic time at Hale Kai. The house is cosy and roomy and very well equipped. It is right on a beautiful beach which is fantastic for swimming. We even swam with the turtles. It is close to all the local attractions. We will definately be back if we can. Thank you. This is a lovely HOME with absolutely beautiful views. The beach is quite isolated, which makes you feel as if you are a world away. We stayed there in the middle of summer, and barely saw anyone else on the beach. The house is equipped with pretty much anything you could need. Waking up to views from the Master bed was the best view we had in the whole of our Hawaii trip. Hawaii dreams made here! Private!Amazing beach right out your door, which can be enjoyed from nearly every room!Nightly sunset cocktails on the deck. Yet close to town for exploring, farmers mkt,coffee...can't wait to come back! Our family of 5 enjoyed our stay at Hale Kai. The living and sleeping arrangements were comfortable. The beach access was wonderful. The quiet North Shore is what a true hawaiian vacation is all about. Although the house is a bit warm, no a/c in July we enjoyed our stay. Thank you! The layout sells this place. Open and on a beautiful stretch of beach. I would recommend renting this property. From the moment we found the beach house, entered the gate and unlocked the front door and walked in we knew this was the place to be. What a fantastic property and great views and the ocean as your front yard swimming pool. Our family and friends were most envious of us. We will definitely be back again. One thing is that the kitchen probably needs a makeover. Mahalo to Team Real Estate their service and email communication was great. Lovely holiday home right on the beach with everything you could need for a relaxing stay. The home is starting to show its age and could do with some refurbishments, but had a pleasant homely feel to it. Fantastic location for exploring the north shore and beyond or just sit and watch the whales and turtles or swim in the clear warm water. Would definitely rent again and would recommend to others. My sons and I enjoyed our stay at this beachside house so much that we all found it almost impossible to leave. It is in a fantastic location, right on the beach. The house is well set up and obviously well loved. We would most definitely return to Hale Kai. Hale Kai once again did not disappoint. Location unparalleled. Beach awesome. House rustic, needs some TLC. Carpets soiled. wood floors tacky, most likely from the salt air? Sliding doors need attention, afraid we'd break them trying to use them. Doors to outside showers would not unlock. That being said, great location for the cost. The house is wonderfully located in The North Shore. The distribution is amazing. It does need maintenance, half the lights didn't work, the kitchen small appliances and some of the pans are very dirty. Other than that we enjoyed the wonderful views and the deck, and the beach!!! if you have little children be advice this is not a beach to take baths, the waves and the currents are vey strong even though is beautiful. The view from this home is picture perfect, beautiful. Ocean and sand for miles... This is not our first time here, and won’t be our last, I like to think of it as our Hawaii home. The North Shore is fantastic and this place is so convenient to everything. Just loved every minute of time spent there. Can’t wait to return! It is such a wonderful place to stay for me. I have rented many times over the years, it is like going home for me. Beautiful location in nice quiet neighborhood. Located close to town. Living area large and roomy for family evenings and dinners. Sandy beach front, great for swimming and turtle watching. Turtles 5 mins walk ! Home has wonderful location right on the beach in a quiet area, we had a great time. As mentioned by others, it is a bit worn in some areas but nothing you can't live with. The toilet handle was broken which meant you had to take the lid off of the tank to flush and the screen doors didn't stay on track but in the bigger scheme of things we were very happy. There was some confusion with the cleaning company not knowing we were arriving when we did so we interrupted the lady when we got there; she was extremely nice but in a hurry so I'm not sure if she covered all the usual bases. The fans were a godsend but the blades were covered in dust and it would have been nice to have a vacuum and a mop to keep things tidy. Overall, I would definitely recommend this place as you can't beat the charm and location. Team Real Estate we a pleasure to work with. Team Real Estate is top notch. Always a great experience. My family had a wonderful time at this beach house. It was very comfortable with plenty of room. The outside deck was great. Location, location, location! The Hale Kai rental was the perfect hawaiian cottage experience. The house was located on a beautiful, private beach with breathtaking views of the Pacific Ocean. Close to the small quaint town of Haliewa. A quiet location, set back in a gated community. The property is kept nice with plenty of space outside for activities. The inside of the house has a 70's cottage feel. I loved the wood ceilings throughout, especially the peaked living room, very polynesian. The interior was dated, but adds to the charm of the home. Plenty of space inside for a family. The bathrooms and kitchen need some updating, but all the modern convenience are supplied. The management office at Team Realty were extremely helpful and knowledgeable. I would recommend Hale Kai as the perfect place to stay for a relaxing vacation in Hawaii. We enjoyed our stay very much. Home has wonderful location right on the beach in a quiet area. Beautiful sunsets and lots of turtles to view each day. Our 3rd house in 3 years in this area. The nicest beach area of the 3. House was as nice as the other 2, more nice in some areas and less in others but over all, very good. Kitchen was more rustic than others but was very functional. Great home, fantastic price! Some parts of this place are a little rustic, but I'm sure that helps keeps the price right. Exctiopional value! My family has stayed here a few times now. And we'll be back. Absolute best location!! The ocean is just steps away from the house, felt like a private beach as there were very few people on it everyday. We visited in the spring, so the ocean was great for swimming with the sea turtles. The house is an adorable older home that has been maintained well over the years. Our family has been coming to Oahu or Kauai for the past 10 years every spring break, this was our favorite vaction rental by far! An original North Shore beach cottage with a great deck and magnificent ocean views. Great location close to Haleiwa and very convenient to all North shore attractions. Huge yard, great for kids to play. Magnificent sunsets off deck. Saw Sea turtles, a seal on beach out front and whales breaching from back lawn. Kitchen and bathrooms old, but well-stocked and very functional. Only real issue is mildew on lounge suite cushions, needs cleaning or replacing. Team Real Estate's process was very easy, even as visitors from Australia. Overall, an economical way to stay in a very beautiful area of Oahu. It was a good contrast to busy resort accomodation. Great location! But property is a bit run down. Location of this house is awesome - right on Papailoa Beach. Turtle on the beach in the waves. Swimming is possible - but not for young kids. Surf is VERY strong. House really needs some love - BUT - it is a bed and a place to have meals - and the price was right. My Family and I had a wonderful time with our beach front rental. We had all the luxuries of home plus a beautiful ocean view. Our favorite was the Sea Turtles on the beach. We can not wait to come back next year! Nice beach home in lovely location at good value. Our primary constructive criticism is that the soft goods (linens, towels, pillows & furnishings) are very worn, and uncomfortable. We frequently rent homes on the North Shore and suggest the owners upgrade the above goods and slightly raise the rent to would be well worth the expense!! Mahalo nui loa! Although the house was clean, several areas could be addressed. Mattresses are old and uncomfortable in all rooms. The master is two beds put together and not acceptable for the price. The master bath subfloor is wet and smells. Although the house is old it was charming it just could use upgrading in several areas. The house does have ample supplies from the kitchen to linens. We enjoyed the deck and the views. I have and will suggest this location for families as the yard,grounds, and location are perfect. The only true problem was with noise from the sprinkling system that was addressed quickly and that was very appreciated by our group. It was amazing to fall asleep and wake up to the sound of the waves. There were days where we didn't even leave the house because it was so relaxing. When we did, Haleiwa, Shark's Cove, Waimea, Pipeline were all a close drive away. The house and furniture are a bit old and dated- sliding screen doors were not maintained (falling off tracks) but the kitchen was well stocked with utensils, cutlery, etc. 2 full bathrooms plus the outdoor shower were a huge bonus! We were 6 adults and had plenty of room to hang out or have some private time. Another WOW: Never stops being the very best location. As this is our 5th trip to Hale Kai I need to say they just get better and better. The new windows and blinds are very nice addition. Will be back in a couple years for trip #6. Just a couple things: The WiFi was not functional and we tried everything short of calling the company. Please let tenants know when workers will be on property other than gardeners. We enjoyed our stay very much. we are a family of two children ages 6 and 9, their parents and grandparents. We found the house to be very well supplied - the kitchen equipment was outstanding. the tile on the master bathroom floor desperately needs to be replaced or re-grouted. the carpet in the living area needs professional cleaning or replacement. Everything the cleaner could do on a weekly basis was done well. The time that we were there was very hot and humid. We would have been much more comfortable with air conditioning. We have stayed at Hale Kai multiple times over the past eight years and the location is heaven on earth to me. The hardest part of any of our stays is leaving. We had a fantastic time at the rental home on the north shore. The house was very "beach cool" and a great location and superb views. Perfectly located in between Haleiwa and Sunset Beach so it was perfect for us. Beds were very comfortable by the way which was huge for us. Nothin worse then going on vacation and having to sleep in a bad bed. Did you have a good overall stay? YES! Was the vacation rental in a great location? YES! Was the home clean and in good shape? YES! Was the vacation rental management staff helpful? YES! I really liked how the walls and windows opened up to let the the wind blow through the house - especially the wall to wall windows in the master bedroom - enjoyed the sound of huge waves crashing on the beach. This is why you come to Hawaii if you want to relax. AWESOME Beachfront property. The house is definitely outdated, but worth the view and beach access.